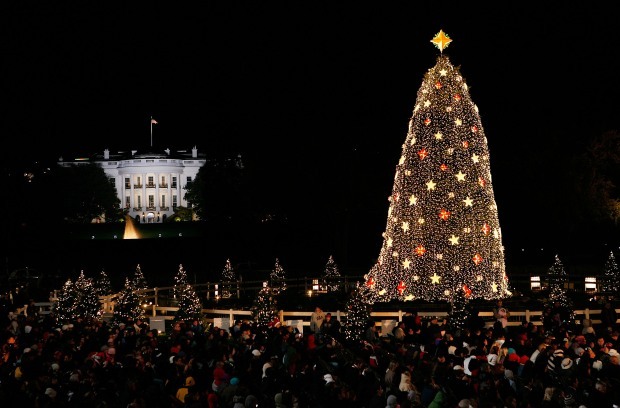 Blues and maroons will highlight this year's National Christmas Tree Lighting Ceremony. The National Park Service said blues legend B.B. King, singer-songwriter and pianist Sarah Bareillies and the band Maroon 5 will perform at this year's event. The tree lighting is scheduled for Thursday, Dec. 9, at 5 p.m.
About 13,000 people are expected to crowd on to the Ellipse at President's Park to usher in the holiday season. The Park Service said it will announce more performers and special guests soon. On Friday morning, the NPS opened a lottery for tickets to the event. About 3,000 tickets are available for seats and 10,000 standing room tickets are also part of the lottery. You have until midnight on Sunday, Nov. 7, to enter. Click here to enter. The Park Service will start notifying winners next Wednesday. Let's Go Around Town: Keep up with what's happening in the D.C. area anytime, anywhere. Follow us on Twitter and Facebook. Sign up for our e-mail newsletters and find out What You're Doing Tonight with texts delivered right to your mobile phone -- just text DCTONIGHT to 622339 to sign up. (Message and data rates may apply.) Don't forget our iPhone app and Flickr pool!